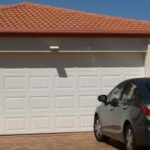 Sectional Garage Doors, also known as Panel Lift Garage Doors, are the best looking and most durable in the domestic garage door range. The panel itself compared to other types of doors is very thick (0.6mm rather than a roller door, which is around 0.4mm). While this doesn’t sound like much, the difference is massive. 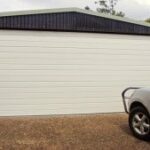 Panel lift garage doors can span a very wide distance while still maintaining its strength and integrity. Residential sectional garage doors generally come in three different styles. A horizontal timber slated looking door. The profile has been around as long as the other styles but has not dated as the other two designs have. This design will look fantastic on any house, whether it’s a rendered modern house, a weatherboard Queenslander or even a brick and mortar. This rectangular design suits older, heritage homes. The embossed pattern is around 1m wide and around 4cm high. This is a durable and long-lasting door. The Regency sectional garage door is similar to the Georgian. However, the embossed panels are about half the width but remain the same height. These look great on an older style house that has two single garage door openings. 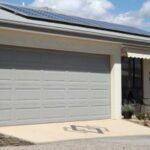 If you want to learn more about our panel lift garage doors Brisbane and beyond, contact us today here or on 1300 4 A DOOR.